Catherine E. Clifford is Professor of Systematic and Historical Theology in the Faculty of Theology, Saint Paul University. 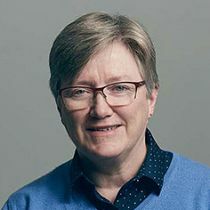 Her research interests and publications are focussed primarily in the areas of ecclesiology, ecumenism, and the history of the Second Vatican Council. A study of the basic principles of Catholic ecumenical engagement, the contributions to progress in unity through the study of selected inter-church dialogues. Implications for common prayer, common witness, and collaboration in ministry. The study of a significant contemporary theologian or topic. L’Église comme signe de communion et de salut au service de la communauté humaine. L’auto-compréhensions de la communauté ecclésiale catholique, l’unité des Églises chrétiennes, la structure des ministères, les laïcs et la diversité de vie au sein d’une Église mondiale. Étude des principes de base de l’œcuménisme catholique, des contributions au progrès de l’unité chrétienne à travers l’étude de quelques dialogues entre églises, conséquences pour participation dans la prière, le témoignage et la collaboration ministérielle. Histoire de l'Église du XVIIIe siècle à nos jours. Étude de la prière commune de la communauté chrétienne à la lumière de la dimension sacrée du temps, de l’espace, des symboles, du langage et de la musique; origines juives du culte chrétien; histoire de la liturgie occidentale. La structure et la dynamique de la liturgie eucharistique, la liturgie des heures, le culte du dimanche sans la présence d’un prêtre, l’année liturgique, l’inculturation et les tendances pour l’avenir. B.A. (Hons. Religious Studies), University of Waterloo. Yves Congar. The Spirit of God: Short Writings on the Holy Spirit. Trans. S.M. Brown, M.E. Ginter, J.G. Mueller, and C.E. Clifford. Caholic University of America Press, 2017. Decoding Vatican II: Interpretation and Ongoing Reception. Madeleva Lectures. New York: Paulist, 2014. Richard R. Gaillardetz and Catherine E. Clifford. Keys to the Council: Unlocking th Teaching of Vatican II. Collegeville: Liturgical Press, 2012. (also available in Portuguese and Lithuanian). Groupe des Dombes. "One Teacher: Doctrinal Authority in the Church. Trans. Catherine E. Clifford. Grand Rapids: Wm. B. Eerdmans, 2010. Catherine Clifford, Pierre Hurtubise, Francis Morrisey, Le Pape: 25 Questions. Novalis, 2009. The Groupe des Dombes: A Dialogue of Conversion. American University Studies. Theology and Religion, Vol. 231. New York: Peter Lang, 2005. C.E. Clifford, M.Attridge, G. Routhier. Vatican II: Canadian Experiences / Experiences canadiennes. Ottawa: University of Ottawa Press, 2011. Groupe des Dombes. For the Communion of the Churches. Catherine E. Clifford, ed. Grand Rapids: Wm. B. Eerdmans, 2010. Catherine E. Clifford, ed. A Century of Prayer for Christian Unity. Grand Rapids: Wm. B. Eerdmans, 2009. "Sources for the Study of Vatican II," in Cambridge Companion to Vatican II. Ed. Richard R. Gaillardetz. Cambridge University Press, (Forthcoming). "The Legacy of Vatican II: Untying the Knots of a Difficult Reception," in The Reshaping of Catholicism: Twelve Events that Shaped Today's Church. ed. Terrence Merrigan. Leuven (Forthcoming). "Diverse Structures and Procedures for the Exercise of the Teaching Office: Anglican-Catholic Ecumenical Learning," in Diversity in Unity: Rethinking the Episcopal Office in a World Wide Church. Eds. Eugene Duffy and Myriam Wijlens (Forthcoming). “Pope Francis’ Call for the Conversion of the Church in Our Time” in Re-visiting Conversion: Fetschrift for Henk Witte (Studies in Catholic Theology), edited by Stefan Van Erp and Karim Schelkins, 147-177, Brill: Leiden and Boston, 2016. “Yves Congar Opened a Door into Theology's Changing Role,” in Take and Read: Christian Writers Reflect on Life's Most Influential Books, edited by Michael Daley and Dianne Bergant. Apocryphile Press, 2017. “A Dialogic Church,” in Go Into the Streets! The Welcoming Church of Pope Francis, edited by Richard R. Gaillardetz and Thomas P. Rausch, New York: Paulist, 2016. “Discerning the Present Moment,” in 50 Years After the Vatican II Council: Theologians from all Over the World Deliberate, edited by M. Lamberigts, G. Routhier, P. Ferreira Oliveira, Ch. Theobald, and Bosschaert, 51-78, Paris: International Federation of Catholic Universities (IFCU)/Rome: Libreria Editrice Vaticana, 2015. "Final Declaration,” in 50 Years After the Vatican II Council: Theologians from all Over the World Deliberate, edited by M. Lamberigts, G. Routhier, P. Ferreira Oliveira, Ch. Theobald, and Bosschaert, 145-151, Paris: International Federation of Catholic Universities (IFCU)/Rome: Libreria Editrice Vaticana, 2015. “Ecumenical Dialogue, Conversion, and Ecclesial Self-transcendence,” in Lonergan’s Anthropology Revisited, edited by Gerard Whelan, 305-318. Rome: Pontifical Gregorian University, 2015. “The Exercise of Ecclesial Authority in Light of Vatican II,” in The Long Shadow of Vatican II, edited by Lucas Rompay, Sam Miglarese, and David Morgan, 58-82. Chapel Hill: University of North Carolina Press, 2015. “Lonergan, The Development of Doctrine, and the Reception of Ecumenical Consensus,” in Going Beyond Essentialism: Bernard J. F. Lonergan – An Atypical Scholastic, edited by Cloe Taddei-Ferretti, 243-258. Napoli: Istituto Italiano per gli Studi Filisofici, 2012. “Elementa ecclesiae: A Basis for the Recognition of the Ecclesial Character of non-Catholic Christian Communities,” in La théologie catholique entre intransigeance et renouveau. La réception des mouvements préconciliaires par Vatican II (Bibliothèque de la Revue d'histoire ecclésiastique, 65), edited by Gilles Routhier, Philippe Roy, Karim Schelkens, 249-269, Turnhout, 2012. “Anglican-Roman Catholic Dialogue in Canada: Receiving Unitatis Redintegratio” in Vatican II: Expériences canadiennes / Canadian Experiences. 534-558. Ottawa, University of Ottawa Press, 2011. “L’herméneutique d’un principe herméneutique: La hiérarchie des vérités, » dans L’autorité des autorités : L’herméneutique théologique de Vatican II, edited by Michael Attridge, Catherine E. Clifford, Gilles Routhier, and Guy Jobin, 69-91. Paris : Cerf, 2010. “Editor’s Introduction,” For the Communion of the Churches : The Contribution of the Groupe des Dombes. 1-11. Grand Rapids: Wm. B. Eerdmans, 2010. “Die spirituelle Bildung von kirchlichen Mitarbeiten: eine kanadische Perspective,” in Gesendet in den Weinberg des Hernn: Laien in der katholischen Kirche huete und morgen. (Erfurter Theologische Schriften, 35), edited by Benedikt Kranemann und Myriam Wijlens, 141-162, Erfurt: Echter, 2010. “Prayer: The Soul of Ecumenical Renewal,” in A Century of Prayer for Christian Unity, edited by Catherine E. Clifford, 11-23. Grand Rapids: Wm. B. Eerdmans, 2009. "Style is Substance: Origins of John W. O'Malley's Contribution to the Interpretation of Vatican II," Theological Studies 79/4 (2018) 745-760. "A Joint Commemoration of the Reformation in 2017 [Theological Roundtable]," Horizons 44/2 (2017) 405-409. “Dialogue and Truth-Seeking in a Post-Truth Culture,” The Ecumenist 54/1 (Winter 2017) 20-22. “Re-Membering the Body for a Common Future,” Journal of Ecumenical Studies 52/2 (2017)252-271. Also in Grace and Truth (2018), (Forthcoming). “Mercy: Mission and Essence of the Church” Theoforum 47 (2016-2017) (Forthcoming). “Reflections on Peoplehood and the Church,” Theoforum 46 (2015) 271-292. “Dialogue and Ecclesial Identity,” Science et Esprit 68/2-3 (2016) 309-322. "Pope Francis’ Call for the Conversion of the Church in Our Time,” Australian e-Journal of Theology (April 2015): 33-55. “Catholic Perspectives on The Church: Towards a Common Vision,” One in Christ 49 no. 2 (2015): 192-203. “Christian Unity: A Real Possibility in the 21st Century?” Philosophy and Theology 27 no. 2 (2015): 459-475. “Introduction: Round Table / Table ronde – Gregory Baum’s Truth and Relevance: Catholic Theology in Quebec Since the Quiet Revolution,” Theoforum 45 (2014): 311-312. “An Insight into Catholic Intellectual Engagement with Secularity in the Context of Contemporary Quebec,” Theoforum 45 (2014): 313-316. “A Contribution from the Anglican-Roman Catholic Dialogue of Canada to the Anglican Church of Canada’s Commission on the Marriage Canon,” One in Christ 49 no. (2015): 303-306. “Journeying Together: Ecumenism in the 21st Century,” One in Christ 48 no. 1 (2014): 14. “Learning From the Council: The Church in Dialogue,” Theoforum 43 no. 1 (2013): 27-46. “La Conversion de l’Église: une option fondamentale à confirmer, » Unité des chrétiens 164 : 17-19, 2012. “Unity and Mission one Hundred Years On,” Journal of Ecumenical Studies 46: 329-342, 2011. Catherine E. Clifford and Richard R. Gaillardetz, “Re-Imaging the Ecclesial/Prophetic Vocation of the Theologian” Louvain Studies 34: 336-360, 2010. “Reform and the Development of Doctrine: An Ecumenical Endeavor,” The Jurist 71 no. 1 (2011): 35-58. “Crisis in the Church? Theological Roundtable – Excommunication – Communication – a Response to Peter Hünermann,” in Horizons 36 no. 2: (2009): 285-340, at 318-326. “Kenosis and the Church,” One in Christ 43 no. 2 (2009): 2-5. “A New Phase of the Ecumenical Movement” Theoforum 39 no 2 (2008): 235-252. Catherine E. Clifford and John S. H. Gibaut, “Introduction,” Special Issue Theoforum 39 no. 2 (2008): 131-132. “The Local Church and Its Bishop in Ecumenical Perspective,” The Jurist 69 no. 1 (2009): 59-83. “The Ecumenical Context of Dignitatis Humanae: Forty Years After Vatican II,” Science et Esprit [Mélanges Thomas Potvin, o.p.] 59 no. 2-3 (2007): 387-403. “The Collaboration of Theology and Canon Law in Light of Lonergan’s Theory,” Studia Canonica 40 no. 1 (2006): 117-136. “Emerging Consensus on Collegiality and Catholic Ecumenical Responsibility,” The Jurist 64 no. 2 (2004): 332-360. “Kenosis and the Path to Communion,” The Jurist 64 no. 1 (2004): 21-34. “La pratique oecuménique de la théologie,” Laval théologique et philosophique 60 no. 1 (2004) : 53-64. «Marie dans le dialogue œcuménique, » Theoforum 34: 355-374, 2003. “Reflections on the Nature and Purpose of the Church: Catholic Theological Society of America,” Ecumenical Trends 32 no. 9 (2003): 1-9. “Anglican-Roman Catholic Dialogue in Canada,” Journal of Ecumenical Studies 40 no. 3 (2003): 29-244. “Dialogue and Method: Learning from the Groupe des Dombes,” One in Christ 38 (2003): 42-57. “Lonergan’s Contribution to Ecumenism,” Theological Studies 63 (2002): 521-538. Attridge, Michael, Patricia Beattie, Catherine Clifford, et al. “A Reflection on The Nature and Purpose of the Church. A Stage on the Way to a Common Statement,” One in Christ 37 (2002): 81-95. “The Joint Declaration, Method, and the Hermeneutics of Consensus” Journal of Ecumenical Studies 38 (2001): 79-94. “A Ministry of Communion for the Whole Church: Proposals for Conversion,” Journal of Ecumenical Studies 35 no 3-4 (1998): 370-379. "Reception of the Final Report: Beyond Strengthened Agreement," One In Christ 32 (1996): 130-148. “The Protestant Monastic Community of Grandchamp: History and Spirituality,” Cistercian Studies Quarterly 26 no. 3 (1991): 227-245. “Catholic Perspectives in The Church: Towards a Common Vision,” Proceedings of the Catholic Theological Society of America, Proceedings of the 70th Annual Convention Vol 70; (2015): 1-2. "Vatican II and the Challenge of Renewal in the 21st Century" in Revisiting Vatican II: 50 Years of Renewal. Conference Proceedings. Dharmaram College, Bangalore. (January 31-February 4 2013): 588-600. "The Priority of Social Justice in the Teaching of Vatican II" in Turning to the World: Vatican II, Social Justice and the Common Good. Conference Proceedings, March 8-9, 2013, St. Thomas More College, Saskatoon. Forthcoming. "The Tübingen School and the Theological Basis for Catholic Ecumenical Engagement" in The Theology of Walter Kasper: A Celebration of His Life and Work, Conference Proceedings, April 25-27, 2013, Notre Dame University Press. “Ecclesial Conversion and the Path to Christian Unity,” in Proceedings of the Catholic Theological Society of America, Proceedings of the Sixty-eighth Annual Convention Vol 68 (2013): 74-75. Learning from the Council: The Church in Dialogue” [in Portuguese translation], Deus na Sociedade Plural: fe simbolos, narrativas. SOTER, 26 Congresso International, 8-11 Julho 2013. Sào Paolo: Ed. Paulinas, 2013. “The Word and Sacrament in Ecumenical Dialogue,” Church-Ecumenism Topic Session, Catholic Theological Society of America: Proceedings of the Sixty-seventh Annual Convention, Saint Louis, MO, June 7-10, 2012. “Church of Saints and Sinners: Ecclesiological Challenges Arising from Ecumenical Encounters,” Catholic Theological Association of America: Proceedings of the Sixty-sixth Annual Convention, San José California, June 9-13, 2011. Vol. 66..
Catherine E. Clifford and Richard R. Gaillardetz, “Re-Imaging the Ecclesial/Prophetic Vocation of the Theologian” Catholic Theological Society of America: Proceedings of the Sixty-fifth Annual Convention, Cleveland, Ohio, June 10-13, 2010. Vol. 65. “International Network of Societies for Catholic Theology,” in Catholic Theological Society of America: Proceedings of the Sixty-fifth Annual Convention, Cleveland, Ohio, June 10-13, 2010. Vol. 65. Called to be a Learning Church,” International Conference on “Receptive Ecumenism and Ecclesial Learning: Learning to be Church Together,” Durham University, England, January 10-14, 2009. (Forthcoming, Oxford UP) http://www.centreforcatholicstudies.co.uk/?page_id=224 “Select Session: The Bishop’s Participation in the Threefold Office of Christ,” Catholic Theological Society of America: Proceedings, 2007. “Dialogue and Method: Linking Theological Consensus and Ecumenism of Life,” Ökumene des Lebens als Herausforderung der wissenschaftlichen Theologie /Ecumenism of Life as a Challenge for Academic Theology. Proceedings, of the 14th Academic Consultation of the Societas Oecumenica. Beiheft zur ökumenischen Rundschau Nr. 82. Bernd Jochen Hilberath, Ivana Noble, Johannes Oeldemann, Peter de May, eds. 209-223. Frankfurt am Main: Otto Lembeck, 2008. “Ecclesiology: The Church’s Mission and Ecumenical Dialogue,” Catholic Theological Society of America: Proceedings of the Fifty-sixth Annual Convention 56 (2001): 160-162. "Review of From Vatican II to Pope Francis: Charting a Catholic Future. Paul Crowley, ed." in Worship 90 (2016) 470-471. "Review of Walter Kasper, The Catholic Church: Nature, Reality, and Mission. London/New York: Bloomsbury / T&T Clark, 2015. in Theoforum. “Review of Joseph Famerée, Vatican II comme style : L'herméneutique théologique du Concile, Theoforum 46 (2015) 390-392. "Review of De Mey P., De Witte P., Mannion G. (eds. ), Believing in Community: Ecumenical Reflections on the Church," in Ephemerides Theologicae Lovanienses 93 (2016) 346-349. "Review of A. Denaux, De Mey P.The Ecumenical Legacy of Johannes Cardinal Willebrands (1909-2007),” Cristianesimo nella storia 36 (2015): 710-713. "Review of Vertin, M. (ed) No Turning Back: The Testament of Margaret O’Gara (1947-2012)," in The Ecumenist (2015). "Review of Yves Congar, My Journal of the Council. Collegeville: Liturgical Press, 2012. Theoforum 43 (2013) 193-195. "Review of Erin M. Brigham, Sustaining the Hope for Unity: Ecumenical Dialogue in a Postmodern World. Collegeville: Liturgical Press, 2012.," in Worship (2015): 92. "Review of Douglas M. Koskela, Ecclesiality and Ecumenism: Yves Congar and the Road to Unity (Milwaukee, WI: Marquette UP, 2008),” in Logos: A Journal of Eastern Christian Studies 52 (2011) 142-146. "Review of In God’s Hands: Essays on the Church and Ecumenism in Honour of Michael A. Fahey, S.J. Jarislav Z. Skira and Michael S. Attridge, eds. Leuven: Leuven UP / Peeters, 2006,” Logos: A Journal of Eastern Christian Studies 54 no. 3-4 (2010): 401-404. "Review of Koinonia and the Quest for an Ecumenical Ecclesiology, Lorelei F. Fuchs,Grand Rapids: Eerdmans, 2008,” Ecumenical Review 61 no. (2009): 357-359. "Review of Gabriel Flynn, Yves Congar: Theologian of the Church. Louvain Theological and Pastoral Monographs, 32. Louvain: Peeters, 2005. 503 + xvi pp,” Logos: A Journal of Eastern Christian Studies 48 (2007): 117-122. "Review of Claude Geffré, De Babel à Pentecôte. Essais de théologie interreligieuse. Cogitatio Fidei 247. Paris : Les Éditions du Cerf, 2006. 363 pp. Theological Studies 68 (2007): 461-462. "Review of James F. Puglisi, ed. Liturgical Renewal as a Way to Christian Unity. Collegeville, MN: Liturgical Press, 2005, 232 pp, “Studia Canonica 39 no. 1-2 (2005): 391-393. "Review of: Ghislain Lafont, Imagining the Catholic Church: Structured Communion in the Spirit. Trans. John J. Burkhard. Collegeville: Liturgical Press, 2000. ix + 225 pp.” in The Jurist 63 (2003): 194-196. "Review of: ``Genevieve Glen, Ed. Recovering the Riches of Anointing. A Study of the Sacrament of the Sick. Collegeville: Liturgical Press, 2002.” In Studia Canonica 36 no. 2 (2003): 553-555.